I am so pleased to have been a member of this brilliant artist led group for twenty years now. Selection for exhibitions is never guaranteed so I have never been able to assume my work is good enough and that is the strength of The 62 Group. 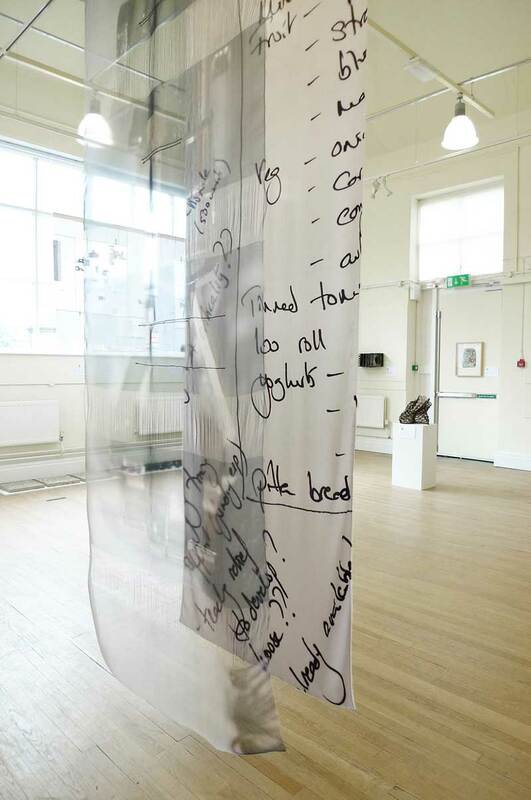 The images below are from the most recent exhibition Making Space. I had a great day on Saturday running a tapestry workshop at Selvedge magazine’s lovely shop on Archway Road in north London. Everyone was very absorbed in their work work and one person even carried on weaving going home on the Tube. That’s a first! Thank you to all who came along and a special thank you to Polly and Jess for looking after us all so well. All my trepidation was blown away by this beautifully and excitingly imagined exhibition put together by curator Professor Lesley Millar and Bryony Windsor the Head of Exhibitions at NCCD. It was great to meet up with some of the other artists and especially meet the Japanese visitors again. The last time I saw them was in Kyoto too long ago now. So here are some photos from the weekend. Yasuko Fujino discussing her beautiful tapestry “In the garden” with Lesley Millar. Ai Ito one of the young Japanese artists with her dynamic work “Baltic Travel Diary”. My tapestry in the distance on a black wall that really lifted the colours..
Lesley Millar centre with Kristin Saedertal in red in front of her tapestry “New Territory”. There is always a mixture of excitement and nerves when your work goes on show for the first time. 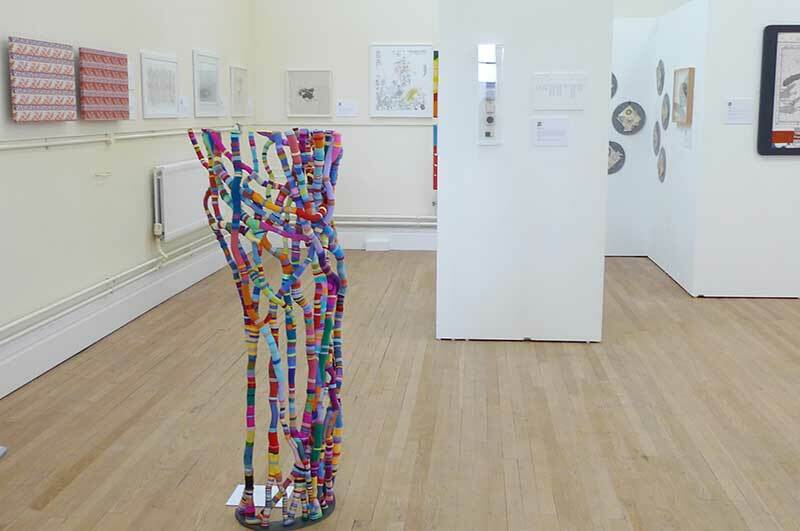 The exhibition is curated by Lesley Millar and brings together an international mix of very diverse tapestry artists. I’m particularly looking forward to seeing the work of the Japanese artists and hoping that some of them will be there tomorrow evening. So here is my tapestry “All about everything” – life’s chaos and it’s veneers. It measures W: 110cm x H: 130cm. It’s just under two weeks to go before the first Knitting & Stitching Show opens in in Edinburgh and I’m busy getting ready. I have been lucky enough to have been asked to exhibit in one of the Gallery spaces. Check out details on their website. There will be one bird on show. Title “Heatwave”….oh if only!